View More In Grill Pans - Page 5. Bring grilling indoors with the Neoflam Square Grill Pan! You do not need to wait for winter to end to enjoy seared steak or your favorite skewer. The grill pan turns your stove into a grilling machine. 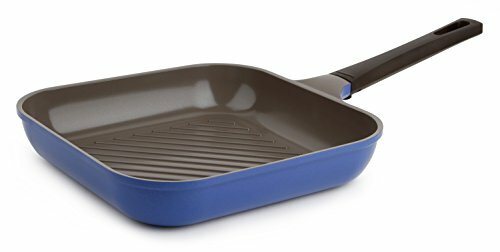 All of the rich flavors and gorgeous markings you associate with the grill can be achieved with this lightweight, nonstick, easy to clean pan. Neoflam has been at the forefront of cookware design and manufacturing since 2008. The combination of durable, lightweight cast aluminum and colorful ceramic coating brought early success as customers looked for new ways to liven up their kitchen. In 2014, Neoflam built a new factory in Korea, in addition to existing factories in China, that borrowed the latest industrial technologies from the automobile industry. This was to ensure Neoflam remains on the cutting edge of kitchen innovation while continuing to provide quality, products to our loyal customers all over the world. Neoflam - lighting a “new flame” in the kitchenware industry. Neoflam's leadership in product design has been recognized by the following prestigious design awards: iF (2012, 2016), Red Dot (2012, 2013, 2014), and Design Plus (2014). Cast aluminum design is lightweight at just 1/3 the weight of cast iron! Measures L 20" x W 11" x H 3.6"; Weighs 2.3 lbs. If you have any questions about this product by Neoflam, contact us by completing and submitting the form below. If you are looking for a specif part number, please include it with your message.